Angela Qithi, BNA local leadership team member; Patrick Felder, Dell Technologies VP for human resources; and Doug Woolley, Dell EMC GM in SA and BNA executive sponsor for SA. Technology giant Dell EMC is looking to advance the recruitment of black talent in SA. 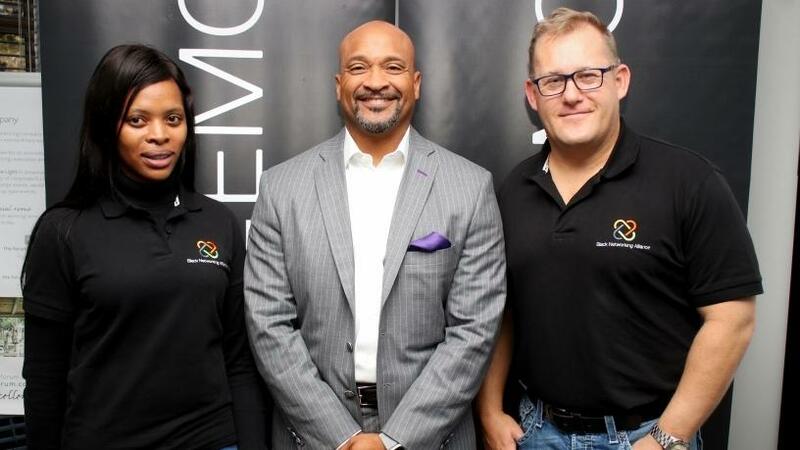 This was revealed by the company's executives yesterday when officially launching the Black Networking Alliance (BNA) employee resource group (ERG) at Dell EMC's Bryanston offices in Johannesburg. This is the first time Dell EMC has taken the BNA initiative beyond US borders where the company is headquartered. Doug Woolley, Dell EMC general manager in SA and BNA executive sponsor for SA, and Patrick Felder, Dell Technologies vice-president for human resources, launched the employee group. The BNA is an internal ERG inside Dell EMC. Its goals are to help black professionals establish working relationships and business networks with peers and mentors within the Dell Technologies group. Dell EMC has other ERG connect team members who share common ethnicity, gender, nationality, lifestyle or sexual orientation. They provide professional development through mentoring, volunteerism and community involvement. Employee resource groups also give team members an opportunity to make a positive impact on Dell EMC's business. According to Felder, the BNA is hyper-inclusive, recognising that experiences from different cultures can be invaluable for everyone. "As such, everyone within Dell Technologies is welcome to join the BNA and further the goal of competitiveness through diversity," he said. The first BNA group launched outside of the US, SA's chapter will continue to drive these goals through four central pillars: recruitment, retaining, development and engagement, said Felder. "Its goal is to include all local Dell employees to help grow and deepen the BNA, so it can empower and accelerate the careers of black professionals across the organisation and serve as encouragement for other companies to launch similar ERGs. In the long term, BNA South Africa hopes to build networks with these other organisations and create a blueprint for inclusivity that serves the entire country." Felder added that expansion of the BNA has been happening rapidly. "We are getting a lot of scale and I am very excited about the continued expansion that we are experiencing. We have about 1 400 members today, which is great as we have been growing year-over-year." He pointed out that the ERGs are meant to be inclusive because being radically inclusive makes organisations better. "The ERGs, to me, help facilitate broader thinking; they help facilitate impact; they help facilitate organisations to touch more people and more places. They also help people, quite frankly, to come together a little bit more. They help us talk about things." Woolley pointed out that the BNA is an evolution of the journey this organisation started about four to five years ago. "It started with our social responsibility to our community with the establishment of the Dell Development Fund. The Dell Development Fund made a commitment on behalf of Dell South Africa to look at how we want to develop talent in the market on a very broad basis. "We have a number of learners that we take through a number of technical courses right from high-performance computing to Linux environments. It's our commitment to build valuable skills into the market," Woolley said. The Dell Development Fund was founded based on Dell EMC's belief that, by improving social conditions, it can improve business conditions in the country. "The second thing that we have done exceedingly well in the course of the last four years is our social outreach initiatives. We have about 12 containerised schools teaching children coding skills and exposing them to various technologies that we have. "From a transformation perspective, we are one of the few organisations that have achieved level one BEE status in South Africa." Thus, he added, BNA is the next transformational part of that journey where the company is trying to see how best it can transform its business. "We have a lot of young black talent at Dell, so it's key that we develop that talent and we have been working with the senior leadership to develop it. We also want to attract black talent."